Converting an old and classic car to electricity is a thorny issue the collector circle grapples with. When does it make sense to convert one? When is it OK to convert a classic? This is a question that comes up often in my circle of classic car aficionados. A Lotus Esprit is both an attractive car and a frustrating one, depending on which series you own. The early version kept the Gandini style resolutely intact and even supercar’ish but the Renault mechanic underpinning, no matter how much it was reworked simply didn’t match the expectations the design offered. Later versions had beefier drivetrains but the style was lost in vulgar US forced bumpers and other atrophied aerodynamics. None the less, a Lotus still remains an interesting and attractive electric conversion prospect. Curious Classic Conversions. Over the few years we’ve seen very interesting electric conversion projects. Some smart, some shocking and others just out right puzzling, they all should make us wonder about the reasons behind. Case in point, converting an old GEO Metro to electricity. It’s smart, fairly simple and you can do it on the cheap. Other older cars and collectables present a different challenge. While there are plenty of under-appreciated 70s and 80s cars, they make a valuable case for a conversion. I’m still toying around converting my 1974 Alfa Romeo Spider to electricity but the continuous drop in Lithium-ion price makes me revisit my options every few months. Then, there are the classic conversions that presents a serious dilemma. 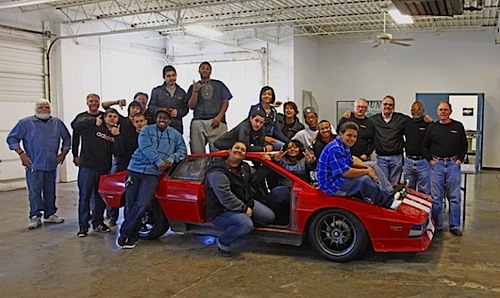 For instance, a year ago I wrote on another news outlet how a few high school students in Kansas City took a 1977 Lotus Esprit with the intention of converting it to electricity. The MINDDRIVE, the brainchild of retired Kansas City architect Richard Stephen Rees, effectively converted it and a year later it was driven coast-to-coast, proving once again EVs can cross from sea to shining sea. Technically Speaking. The original internal combustion engine was removed and replaced with 30, 3.2-volt Li-ion batteries using a chain-drive motor. Performance wise, the team calculated the electric Esprit averaged 218 MPGe at 40 mph and 138.6 MPGe at 60 mph. The More Puzzling Conversions. I’m currently eyeing a few mind-boggling conversions that involve classic cars of a higher caliber. One of the biggest is a 1955 Mercedes-Benz 300SL. The owner is a famous architect in the greater Los Angeles area and unashamedly said the cars was his since new and he can do whatever he wants with it. While I can certainly appreciate this, it would be a little harder for me to make that decision. In this case, the 300SL is a much heavier car than a Lotus or Geo Metro and requires much modifications. Effectively, the car will lose its collector title, along with its current value but it will gain a lot more with its electric drivetrain. The reasons for modifying a collector classic to the point of no return is both personal and involves many intangible angles. In one aspect, converting an old car is a great way to extend its lifespan while lowering your carbon footprint. After all, the car was manufactured a long time ago and you are bypassing buying a newly manufactured one with its production pollution problem. On the other end of the spectrum you have a group of car guys in Detroit taking a brand new Fisker Automotives Karma, ridding it of its underpinning and slapping on a brand spanking new Corvette engine. No matter how you look at it, the reasons to modify a car and ultimately negate a collector car’s value is a personal choice. Would you convert a 1955 Mercedes-Benz 300 SL to electricity? It depends on your age bracket. A 30 to 40 year young person might not, but having spent your entire life with one might make you think otherwise. Still, the rule of thumb is to favor the conversion of a 70s car to electricity if its value is the same or less than the actual conversion. Anything above that cannot be expressed with numbers, it’s an emotional thing. In the meantime, I’d like to ask what classic car would you covert and why? I didn't know Studebaker worked on EVs. You also brought a few interesting models previously, Fiat X1/9 and Porsche 914. I can see the 914 would make a few people cringe. I would also add an Alpine A110 since it's such a light car. Of course, it's best to replicas. Yes, 914s are available although I would go for 924's, 944's, and 928's since they would seem too heavy to modify for that. There are currently only two Alpine A110 in the US to my knowledge, one is around here. The Mexico versions are still affordable. I'm not sure they would be too much to convert since the space in the trunk and front should be sufficient for a small pack. It's a very light car. I've driven an electric Miata and unless you get a first generation, they are heavy for their size. I've always wondered if anuyone converted an 80s Civic?